Over Christmas lunch, with the other monks who live locally, conversation turned to a recent BBC TV programme called “The Nativity”. For me, it is not often possible to watch TV, but one elderly monk recommended it as, ‘one of the best presentations he had seen’ of the Christmas story. That was good enough for me, and so, using the ‘BBC I-Player’ over the past three days, I have managed to watch all four episodes, each lasting half an hour. I found them absorbing. 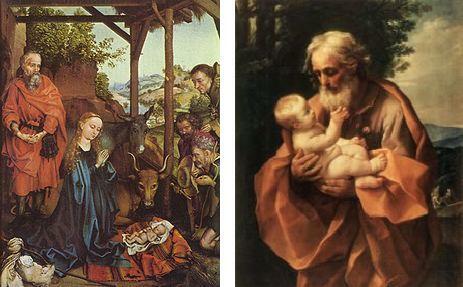 Of course, the story is so very well known to a good proportion of the lay population, and to we religious; firstly, there are the accounts of the Nativity in the Gospels of St. Matthew and St. Luke, and then, secondly, one must add the many years of contemplations of these accounts throughout decades of repeated Christmas liturgical celebrations to arrive at anything like a summation of one’s knowledge of the subject. The totality of this experience may lead one to disagree with, for example, the interpretation of Mary that was inculcated into this TV series; yet such programmes certainly make one reflect – and further contemplate – the story surrounding these age-old events. I believe this to be even more the case, for anyone who has been given the grace to visit the Holy Land. As always, there are the age-old questions. For instance, take one aspect – how did St. Joseph cope with the challenge God put before him? He is portrayed by Matthew’s gospel as a God-fearing, just man, who found himself on the ‘horns of dilemma’, whether to follow the set, cultural, pattern of his fellow God-fearing Jews, or to follow the direct inspiration from God – this under-pinned and strengthened by his respect and growing love for Mary. In the final analysis, he acted against his own judgement, because he followed the advice given by an angel. His role in the events surrounding the birth of Jesus is crucial, because had he not taken Mary, his betrothed, into his house, it is likely she would have been killed. She was pregnant before marriage, and the punishment for an adulteress was death. And, what about Mary – how could she explain what actually happened? When we consider the basic meaning of the word of God as a reference to the eternal Word of God made flesh, the one Saviour and mediator between God and humanity, and we listen to this word, we are led by the biblical revelation to see that it is the foundation of all reality. The prologue of St. John says of the Divine Logos, that “all things were made through him, and without him was not anything made that was made” (Jn 1:3); and in the Letter to the Colossians it is said of Christ, “the first born of all creation” (1:15), that “all things were created though him and for him” (1:16). Yes, our lives are very precious, and in all the everyday experiences we have, we can find God. May our ears, our hearts, our minds be attentive to all God is doing for us, and may we follow St. Joseph – an essential actor, in the real sense – in ‘The Nativity’, the real story of how the ‘Word Became Flesh’. He is THE model for all fathers, whatever the circumstances occurring within our families today.